There are so many superfoods that are great for different reasons. This blog will briefly look at just four of these incredible helpers. Simply by watching what we eat and staying active, we can greatly increase our overall wellness and aid our bodies in functioning at their optimum levels. There are so many advantages of adding these superfoods to your diet, such as: they are easy to obtain, easy to consume, add variety to your menus and boost your health levels in a number of important ways. Let’s take a look at just a few of the many superfoods and what they are particularly good for! Soy can come in a wide range of forms and is found in oats, almonds, and barley as fiber. Other popular and easy to obtain versions are soy milk, edamame and tofu. Some studies have proven that these products help lower cholesterol just as much as leading cholesterol medicines. Foods high in fiber can help you feel fuller for longer periods of time. Eating plenty of fiber rich foods can aid you in your ability to fight off hunger and avoid eating too much and snacking too often. Fiber also naturally aids the body in maintaining proper cholesterol and blood sugar levels making it a multitasking superfood. Most fruits and vegetables have good amounts of fiber. Other great sources include whole grains and beans. 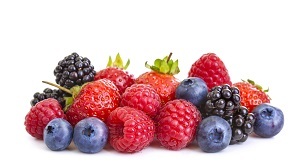 Fresh or frozen berries are a great source of antioxidants, phytoflavinoids and anti-inflammatory characteristics. These traits make them a key tool in the fight against cancer, heart disease and several other chronic diseases. Colorful fruits and veggies also provide these benefits to varying extents. Blueberries are one of the most recommended snacks from doctors! If the fish you choose to eat is rich in Omega 3s you will be helping lower your risk of heart disease. Beyond this, there is a wide range of benefits from Omega3s including: maintaining healthy joints, memory and potentially easing depression. Wild sardines, salmon, and herrings are just a few examples of these amazing fish. Other superfood options for getting Omega3s into your diet include: walnuts, flax seeds and fortified eggs. For more information on how to create and maintain a healthy diet and lifestyle, contact Wellworks For You today!